There are a lot of restaurants on my list that have been open since before I moved to Madison, but the new breakfast-focused Food Fight restaurant on campus landed on my must-visit-soon list. Food Fight rarely gets anything wrong so I made a plan with a friend to try it out. 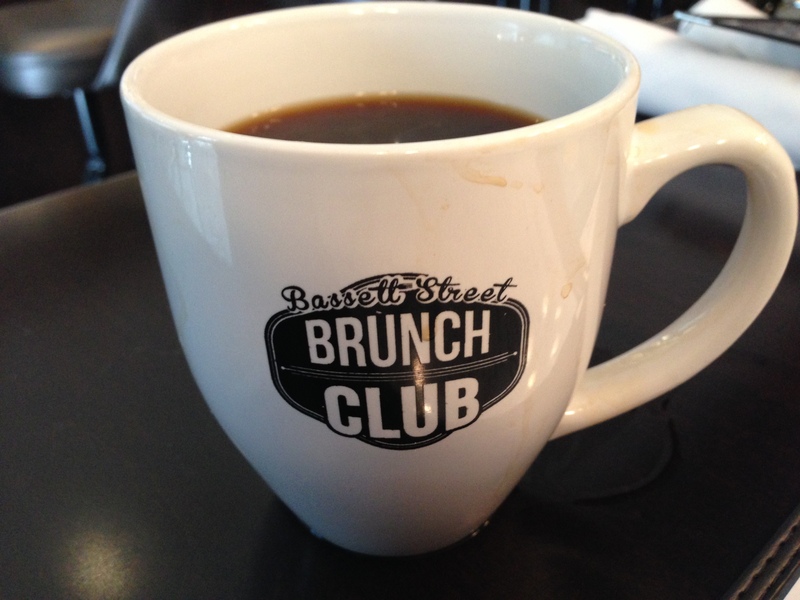 The Bassett Street Brunch Club opened this fall in the newly built Hampton Inn on the corner of Bassett and Johnson streets in downtown Madison. The Brunch Club definitely fits into the downtown boutique feel of the Hampton Inn with modern cement floors and walls, fun patterned booths and bright colored accents throughout. The menu consists of traditional breakfast options, coffee, brunch drinks, homemade donuts, and then they have lunch and dinner menu options. I started with a cup of the Colectivo Coffee they serve. I love that it comes in a big mug instead of those tiny cups most diners offer. The coffee was very good and our waitress kept it full the entire time! I heard their donuts were homemade and they offer three or four different flavors each day. We decided to split one of the chocolate hazelnut donuts before our breakfasts came. They definitely know what they’re doing on the donut front. The donut itself was perfectly fluffy and not at all greasy. 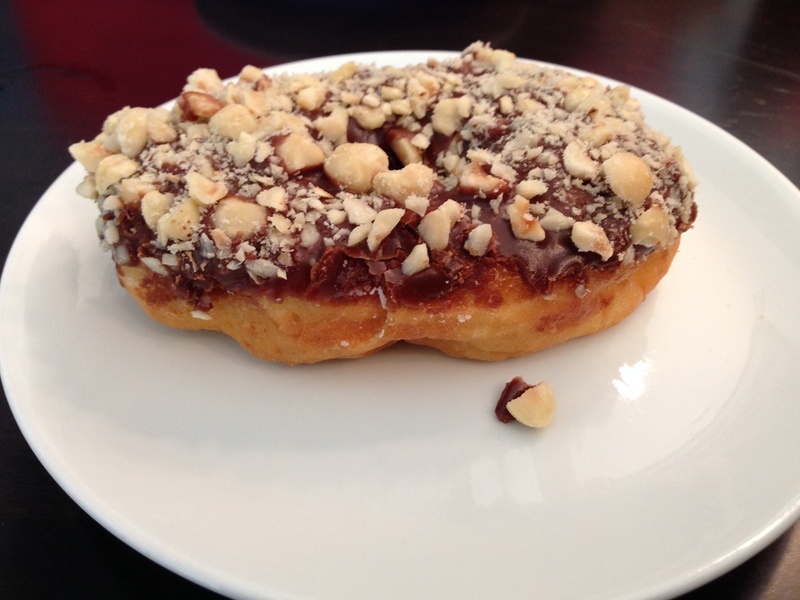 The chocolate topping was better than generic chocolate frosting, but what made the donut were the huge chunks of hazelnut covering the entire top of the donut. It was definitely worth the $1.50! 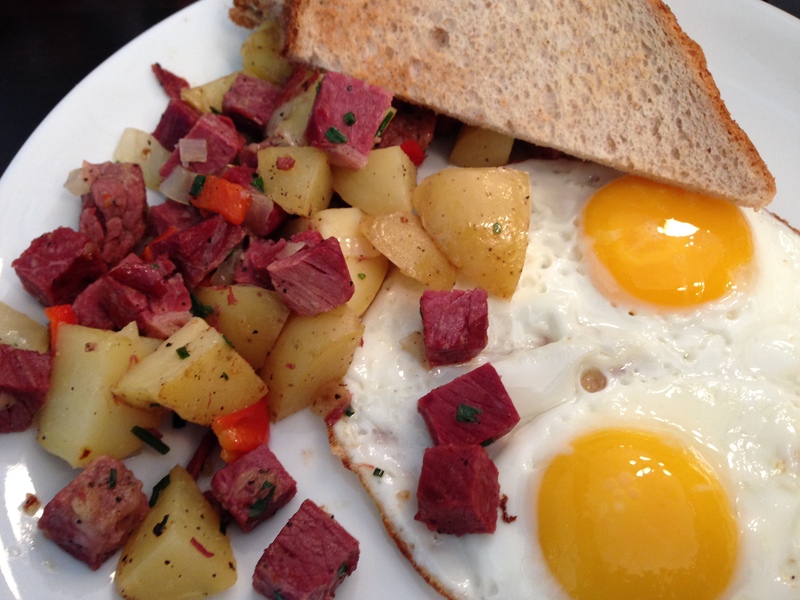 For breakfast, there are two dishes I use to measure a restaurant’s quality – eggs benedict and corned beef hash. The eggs benedict on the menu has a lot of non-traditional toppings, so I opted for the homemade hash. The hash came with two eggs and toast (I usually splurge on toast at restaurants but their jam was unexpectedly bitter so I didn’t finish my slices). Based on the size of the donut I was expecting the breakfast portions to be a bit larger than the cup of hash and two pieces of toast I got. The eggs were cooked perfectly but the hash was basically flavorless even though it had chunks of red peppers and onions. Basically, other than the donut, I wasn’t very impressed with my breakfast. My friend got the lemon ricotta pancakes. She liked them but I thought they were too lemony and kind of mushy. She also got a side of breakfast potatoes (we also kind of measure a restaurant’s quality based on the quality of their breakfast potatoes), and these weren’t very good. 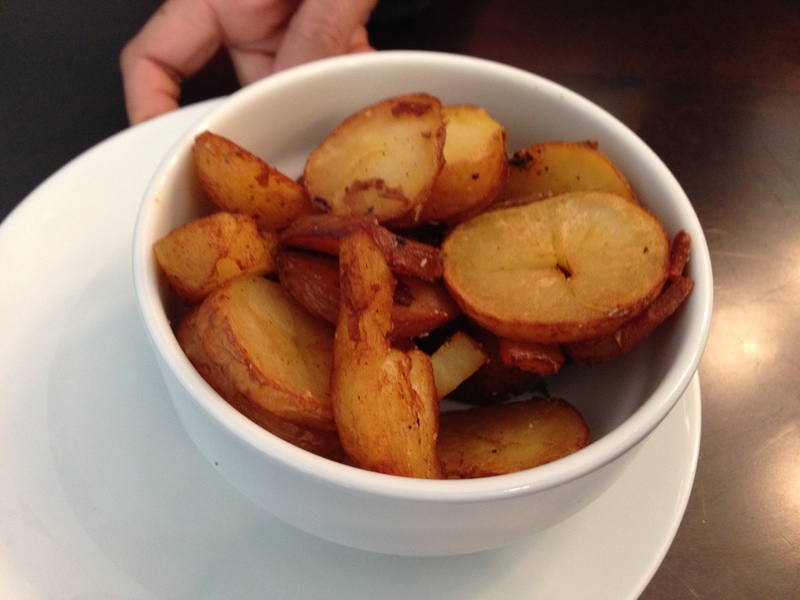 Like my hash, the breakfast potatoes were practically flavorless too. 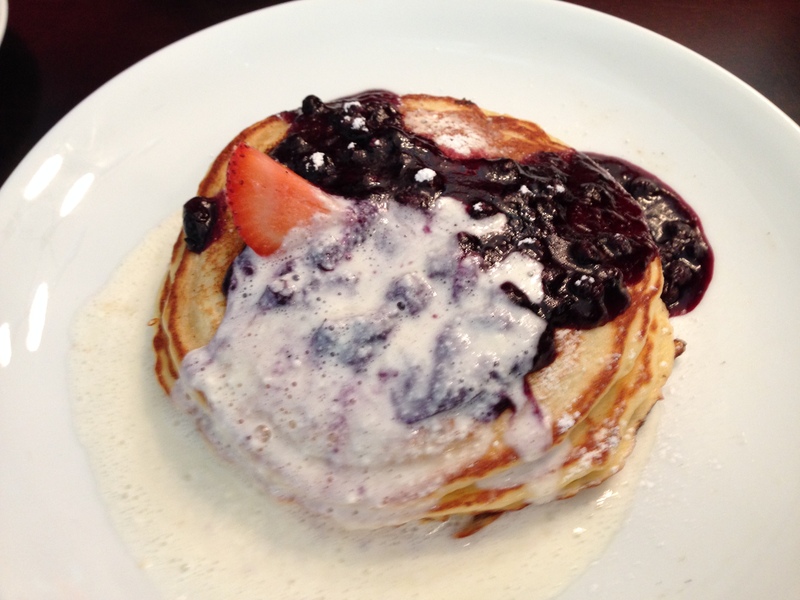 FOODNOTES: The Brunch Club is in a great location and has a fun funky vibe. Our waitress was absolutely stellar, but it wasn’t very busy when we were there and the hostess seemed to awkwardly wander and make unnecessary small talk. The donut and coffee were the highlights of the meal. I didn’t like the lemon ricotta pancakes but my friend did, and my corned beef hash was completely flavorless. They have a ton of dishes on their menu and I really hope some of their lunch or dinner options are better. I would like to give their meatloaf, pot pie or the fried chicken and donuts a try. Hopefully they still have homemade donuts to get as an appetizer when I go to try their dinner options! I really want to like this place so I will give it a couple more chances!